Get Featured on Reston Now! Stand out every day with affordable, effective online advertising from Reston Now! 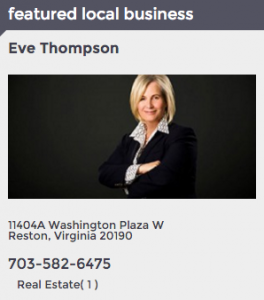 Want your local business to be highlighted to all of Reston? Want to support a fellow local business? Exposure: Your business and a link to your website in front of 10,000s of local customers, who make Reston Now a regular reading habit. Reach them whenever they’re ready to make a purchase decision. Exclusivity: Only one business per category. SEO: Prominent links can improve your search engine standing. Green: No paper, no ink, no delivery costs. Community: Support our community’s only independent, online local news source, committed to local journalism that’s produced in Reston, for Reston. All of this is only $149 per month. Billed via convenient, secure automated credit card processing, which you can cancel anytime. Want more info? Ready to sign up? Contact us at [email protected] or 703-348-0583.